Welcome to the 2019 Wolf Creek Camper Buyers Guide with two non-slide truck campers classified by price, weight, and capacities. 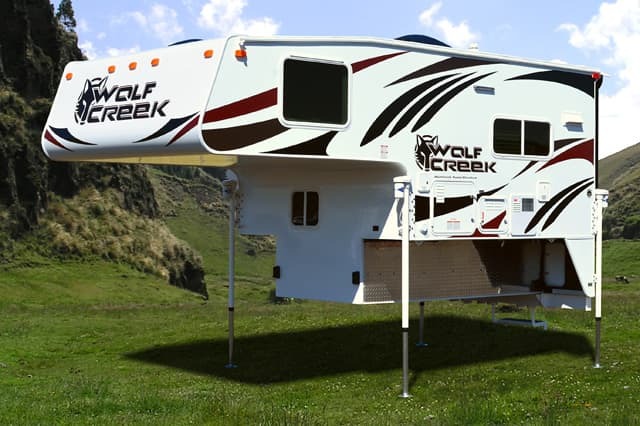 New Wolf Creek pickup campers are for sale through Northwood dealers in the United States and Canada. To locate your nearest Arctic Fox truck camper dealer, check the Dealer Inventory section and New Camper Arrivals. The Wolf Creek floor plans are the Wolf Creek 850 and Wolf Creek 840. To contact Northwood Manufacturing in LaGrande, Oregon, call 800-766-6274. To visit the Northwood website, go to northwoodmfg.com. For additional information, request a Wolf Creek brochure. 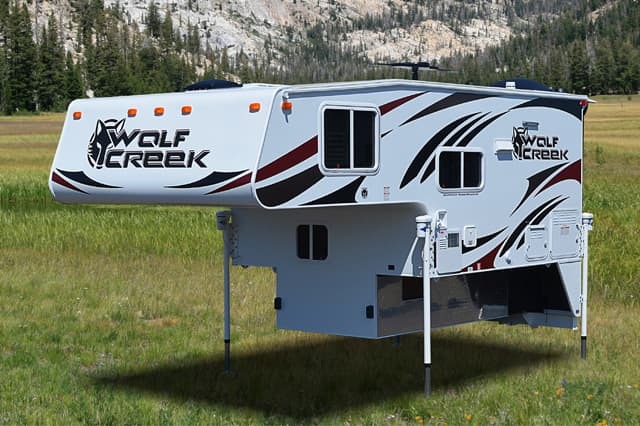 The 2019 Wolf Creek 850 is a hard side, non-slide, wet bath truck camper with an MSRP of $22,890. For further information on this model, check out the Wolf Creek 850 Review. Dry weight above includes the Wolf Pack Value Package (310 pounds) with AM/FM/CD player with Bluetooth, rear awning, 5 cubic foot refrigerator, dual 20 pound LP tanks, Rieco-Titan electric jacks, exterior shower, heated holding tanks, roof rack, ladder, Fox Landing ready bumper, sewer hose storage, utility light roadside, Fantastic Vent, Combo Bunk Cab with dinette light, range cover, sink lid – MSRP $4,103. The 2019 Wolf Creek 840 is a hard side, non-slide, wet bath truck camper with an MSRP of $22,890. For further information on this model, check out the Wolf Creek 840 Announcement and Wolf Creek 840 Review. Click here to read all Wolf Creek articles in TCM. All dry weights, specifications, capacities, and photographs were provided by Northwood Manufacturing. Click here for a free Wolf Creek brochure.